Bring home the terrifying metal behemoths of Star Wars: Episode V – The Empire Strikes Back! 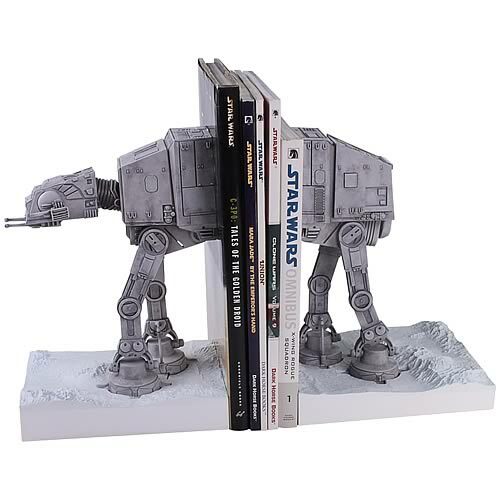 Cast in high-quality polystone and then hand-painted, each set of Star Wars AT-AT Bookends is numbered and comes complete with a matching limited edition certificate of authenticity. Whether they’re holding up an assortment of media or on display proudly by themselves, these collectible bookends are sure to add enjoyment to any home or office. First seen on screen at the Battle of Hoth, the feared AT-AT is the primary assault vehicle of the Galactic Empire for large-scale ground warfare. Tasked with destroying the Rebel’s shield generator, the Imperial AT-AT Walkers completed their objective with ruthless efficiency, laying waste to many Rebel soldiers, vehicles, and installations in the process.